Home » Uncategorized » Design the Next Shoeboxed Shirt and Win! Design the Next Shoeboxed Shirt and Win! Attention all creative Shoeboxers: we’re excited to announce the first ever Design the Next Shoeboxed Shirt Contest! We’re looking for a fun, fresh new shirt design to be featured on our next batch of world-famous free t-shirts. 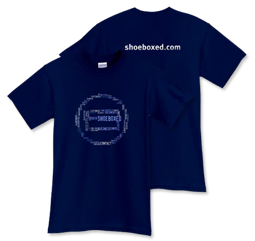 For full contest details, or to submit your own design, please visit the official Design the Next Shoeboxed Shirt Contest page. The contest will run from Tuesday, January 22, until Thursday, February 5, at 5p.m. The design with the most votes at that time will win a cash prize and bragging rights as his or her t-shirt design is printed on the next round of Shoeboxed shirts, which we send to hundreds of thousands of our great users every year. You can still participate in the contest even if you aren’t gifted with an eye for design. Vote for your favorite design in the Shirt Design Gallery— the one with the most votes will win! We will announce the winner on the blog on Friday, February 7, so stay tuned!